There are days when I’m sad that I’m done having babies, especially since the choice was made for me rather than really coming to it on my own. On the other hand I’m not horribly sad to be done with maternity clothes. Over the course I’ve my 5 pregnancies I’ve collected several tubs of maternity clothes and try as I might the past 18 months I haven’t been able to sell them. Problem one is I have clothes I don’t need. Now I have found myself considerably thinner than when I got pregnant this last time, though not as skinny as I’ve been at previous points in my life, but this means most of the clothes in my closet do not fit. Enter problem two. Now I may have “99 problems”, but a lack of ingenuity isn’t one. 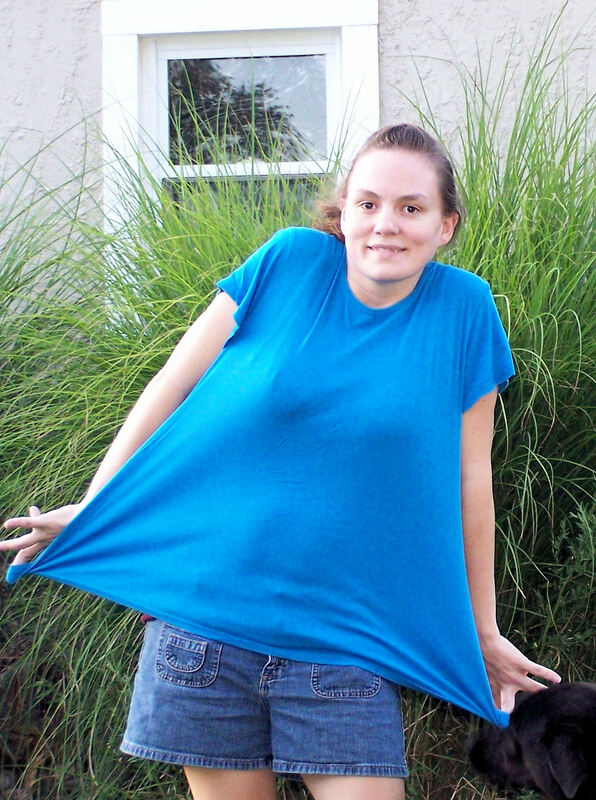 This means we make like a hundred other pinterest users and turn to a t-shirt restyle. Heck, if they can turn a giant men’s shirt into a cute top then I can do the same with a maternity tee. Right? The goofier the before picture, the more impressive the after one. I almost feel guilty adding to the t-shirt restyles out there. It’s such a crazy simple process. Take in sides then embellished with scrap bits. Any craft monkey could do that. Yet, somehow seeing people actually go through the process is so interesting. Prepare to be impressed. Layout shirt to be altered and lay a shirt that you like the cut of over it. Do as I say and not as I do; properly smooth everything out before cutting. 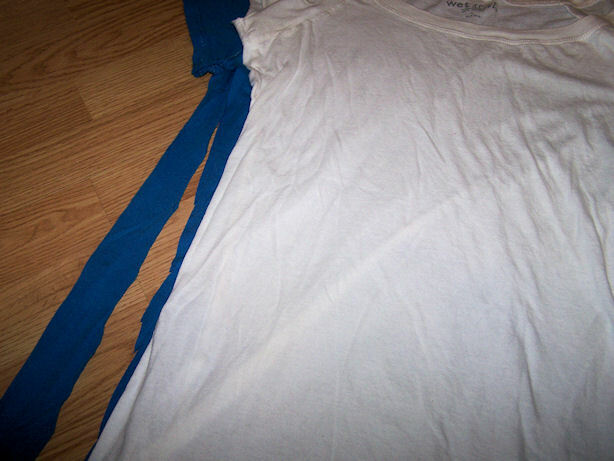 I hacked up both sides and continued along the arms even though my “pattern” shirt was cut a little differently in the sleeves. Be sure to leave extra on the sides for a seam allowance. If you lay it down inside out you can cut and sew up the edges without having to flip it inside out to sew. I took the scraps from the side and cut them with pinking shears to “ruffle” the edges. I cut the seam out and cut the hem and sleeve portion off and then sewed pairs of the strips together making two long strips. And then zigzagged one starting at the shoulder seam and running along the neckline. I sewed a line up the middle of my “ruffle”. 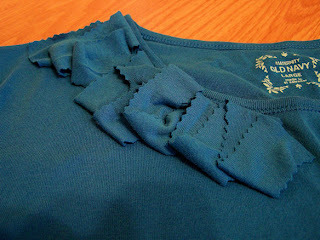 When you hold the shirt up the ruffles fall forward so I did a second layer above it; repeating the process. See far more impressive after that before picture! 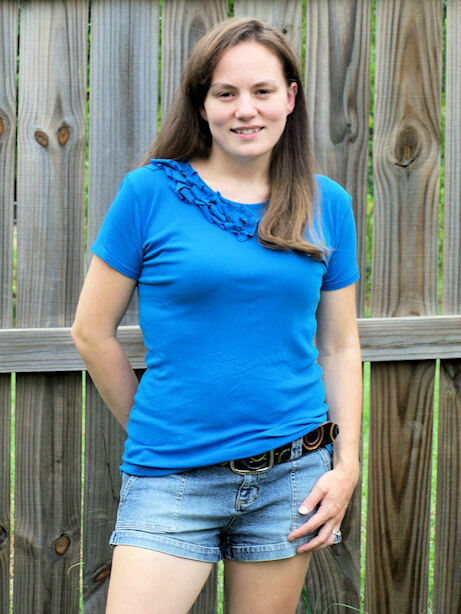 This entry was posted in DIY, restyle, sewing, tutorial and tagged maternity tee, restyle, sewing, upcycle. Bookmark the permalink. That is adorable, your very creative. How cute! The bottom one does look much more flattering than the top one. Great idea! Wow!! What an idea… Looks cool on you.. Thanks for sharing. I think this is a powerfull blog with a lot interesting posts about this stuff. And i just wanna say thnx for this. I’ll follow your blog to see if you post more stuff like these!